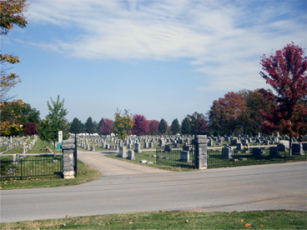 The City of Franklin maintains a 40 acre cemetery on the east side of the city. What is known today as Greenlawn & Shadyrest Cemetery was opened in the late 1800's, and contains many additions since the original plat. The cemetery office is open Monday through Friday, 7:00 am thru 3:30 pm with the cemetery gates open until dusk. The City presently has a contract with Delk Services for maintenance of the cemetery grounds. Josh London is the Cemetery Sexton and maintains records of burials at the cemetery. The Sexton is in the office daily from 11:00 am to 12:00 pm. The actual records of lot purchases are kept at City Hall. Appointments for plot sales or other business can be made by calling (270) 586-4497. The Greenlawn Cemetery was established in 1871, since then there have been 24 Cemetery Sextons. The current Cemetery Sexton is Josh London. The cemetery covers approximately 40 acres. Greenlawn has 17 different sections and Shady Rest has 4 different sections. There are approximately 16,500 occupied graves in the cemetery. Greenlawn and Shadyrest Cemetery require a 24 hour notice before having a funeral. All burials in the cemetery require a vault. (concrete, steel, plastic, or wood). All monument companies setting monuments in the cemetery should contact the Sexton for a Monument Installation Request Form. To purchase graves or for information on existing graves contact Cemetery Sexton Josh London at Office (270)586-4497 Cell (270)776-0936. For information regarding fees and charges see the Cemetery Ordinance on this site. Prices in the ordinance for opening & closing graves don’t include tent set-ups or lowering devices. Cemetery personnel only opens & closes the grave nothing else is provided by the cemetery personnel. All other services are the responsibility of the deceased family or Funeral Home. A few years ago the City of Franklin started a Veterans Section inside Greenlawn & Shadyrest Cemetery. In this section graves are provided at no cost to American Veterans. Contact the Cemetery Sexton for more information or availability of graves in this section. Good Friday through the Tuesday following Easter. From one day before Memorial Day through two days after Memorial Day. From one day before Mother's Day through two days after Mother's Day. From one day before Father's Day through two days after Father's Day. *No Shepherd Hooks allowed on Cemetery Grounds! The following fees for the Greenlawn Cemetery have been adopted by the Franklin City Commission and apply to all sections of the municipal cemetery, including Shady Rest. Per ordinance 620.2-11-2007 effective November 30, 2007 and subject to change by ordinance.